Surprise! Fat is actually good for you and also a necessary part of a healthy diet. 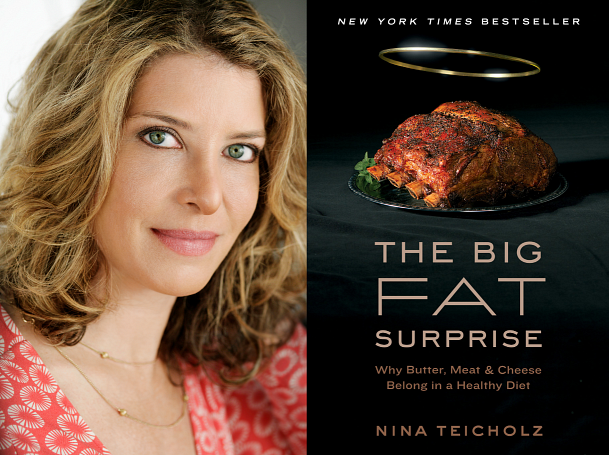 So writes Nina Teicholz, an investigative science journalist and former vegetarian of 25+ years, in her must-read book, The Big Fat Surprise: Why Butter, Meat, and Cheese Belong in a Healthy Diet. When it comes to books taking the nutrition and diet community by storm, this is as closest as it gets with a large number of our clients requesting that we have her on Financial Sense Newshour to discuss the science, politics, and history of where America went wrong on health. If you are unaware of Nina, her book, or the massive dietary shift away from the conventional wisdom of the last 50-60 years, here's what she had to say on why she abandoned vegetarianism and now embraces a diet consisting of a healthy dose of butter, meat and cheese. In the early 1900s, Teicholz explained, heart disease was very rare, but rates quickly rose in the 1920s and 1930s to become the No. 1 killer in the nation. There was a rush to answer the question of what causes heart disease. One researcher, Ancel Keys with the University of Minnesota, proposed his diet-heart hypothesis, which held that saturated fat and dietary cholesterol would cause blood cholesterol to rise and clog arteries like hot grease down a cold stove pipe, to use his analogy. That hypothesis caught on with medical and nutritional professionals, Teicholz stated, and came to be the leading theory that has guided dietary advice ever since. Ancel was a dogged promoter of his theory, and he was able to get himself onto the nutrition committee of the American Heart Association, and in 1961 the group issued the first advice anywhere in the world telling the public to cut back on saturated fat and cholesterol in order to prevent heart disease. All foods contain a mixture of saturated and unsaturated fats, and these are the focus of Teicholz’ book. Cholesterol has become an obsession of nutrition science and cardiovascular disease researchers for more than 60 years. Trial after trial has shown that the total amount of cholesterol consumed doesn’t correlate very well with risk of heart attack and cardiovascular health. The focus then shifted to low-density cholesterol — LDL, considered bad — and high-density cholesterol — HDL, known to be good. Subsequent research, however, has been unable to show that reducing bad cholesterol through diet is a good predictor of reducing the risk for heart disease. It turns out that among markers people typically track with cholesterol panels, the HDL-to-triglycerides ratio is the most reliable predictor of cardiovascular outcomes, Teicholz stated. To improve this ratio, doctors will usually recommend exercise or maybe red wine. Teicholz credits her background in studying political science with being instrumental in helping her untangle the mess of official dietary guidelines. It’s been the case in the field of nutrition that anyone who has questioned Ancel Keys’ hypothesis has been essentially silenced or drummed out of their research position, Teicholz noted. The food industry realized early on that it needed to influence science at the source, she noted, and began funding universities and chairs. This continues today, with the food industry heavily influencing guidelines. After guidelines advising Americans to cut out saturated fat and cholesterol were put into place, we saw two results. Starting around 1972, Americans switched from high-fat foods such as red meat and eggs to carbohydrates. These carbs grew to be more than 30 percent of our diet, representing a major macronutrient shift in the way that Americans ate, Teicholz stated, with devastating consequences. The other impact was that Americans stopped eating saturated fats, and shifted to unsaturated fats in the form of unsaturated margarine and polyunsaturated vegetable oils. They are now around 8 percent of all the calories that we consume and have become the backbone of the processed food industry. Unfortunately for us, these have been found to cause oxidative stress when consumed after being heated, and have inflammatory effects. Regardless, our guidelines haven’t changed. Listen to this full podcast on our site by clicking here or purchase a copy of her must-read book on Amazon by clicking here.